By the time you first notice bowing or buckling in your foundation walls, it's likely that the problem has been present for a long time. Bowing foundations are often caused by a force called hydrostatic pressure. Hydrostatic pressure occurs when water presses against your basement walls with more force than the walls can withstand, causing them to move inwards. Cracking, bowing, and buckling foundations is a serious problem that should be addressed right away. When you choose to restore your foundation, bear in mind that removing and replacing the foundation is by no means the only foundation repair option available. In fact, it's usually not the best one! If you'd like a free foundation inspection and repair quote, contact Foundation Supportworks of the Tri States of Iowa, Illinois, or Missouri today! We serve Burlington, Quincy, Kahoka and many areas nearby. Horizontal cracks, wall shear, buckling, and bowing of a foundation wall with severe structural damage will only get worse as time progresses. 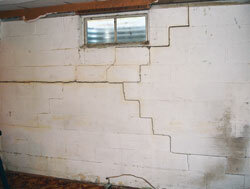 In unusual cases, the only way to repair this problem is to completely remove and rebuild a home foundation. The process begins with your yard. Before replacing the foundation, the former foundation must be dug out and removed. All landscaping around the foundation, such as walkways, steps, gardens, foliage, and other landscaping along the foundation will need to be taken up, and the soil will be heaped in mounds around the house. Rebuilding a foundation wall is expensive, invasive, time-consuming, and disruptive to your home. Additionally, foundation replacement merely replaces the damaged foundation with another one - which can fail in turn over time. Replacing a foundation wall with a new one should only be done when it's deemed that repair is not a good option. Foundation wall anchors, often installed in the Iowa, Illinois, or Missouri area, are slightly more effective for bowing foundations. These helical wall anchors include a long rod, and a corkscrew-like helical shaft that mounts to the wall plate on the inside of the foundation walls. When installed, large holes must be drilled in the wall- in the case of block walls, a block or half-block is removed. 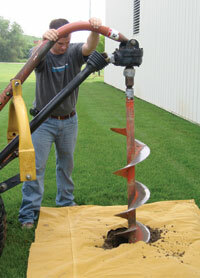 The helical anchors are installed and anchored into the soil. Once the helical anchor is in place, the hole is refilled with concrete, and a wall plate is installed over the top. The Supportworks, Inc. Wall Anchor System, provided by Foundation Supportworks of the Tri States, offers a reliable and solid foundation repair system for the state of Iowa, Illinois, or Missouri. 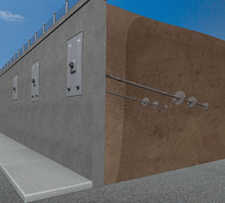 Supportworks Wall Anchors include three main components: an interior wall plate, a connecting steel rod, and an exterior earth anchoring system. To install a Supportworks foundation anchor, a small area of lawn is removed, and the space underneath is excavated. An anchor is placed inside the hole, and a small hole is created in the foundation wall from the inside. The steel rod -- which has no corkscrew end -- is pushed through the earth to where the anchor is placed outside. The anchor is fixed on the rod, and the earth is returned and packed tight. The lawn is returned to its original state, and a wall plate is mounted on the steel rod on the inside of the foundation. The wall plate is tightened against the wall, and this tightening is repeated over time. Periodic retightening of the wall plate against foundation wall has the potential to pull the wall back to its original position. 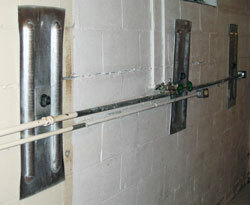 Additionally, foundation anchors are cost-effective and can usually install in a single day. Year-round installation is possible, and the job can be completed with minimal yard disruption and with no need to replace the foundation. More information about foundation wall anchors. If your issue is foundation settlement or a damaged crawl space, there are many other options that you should consider. If you live in Iowa, Illinois, or Missouri and foundation anchors are a solution you're interested in, click here for a free foundation wall repair quote! Otherwise, click here to learn about crawl space repair, or click here to learn about how to level a foundation!